If you're looking for financial advisors that have your best interests at heart, it's important to use an advisor who charges fees not commissions. Why is this important? An advisor's commission is based on how much you contribute and how much you make with your investments. This is a risky way to invest your savings. However, because we are fee-based, we always have your best interests at heart. In fact, we strive to create financial stability for you and ensure financial independence as well. Most importantly, we maintain a disciplined approach to investing and always give you the personal attention you deserve. Invest your money the right way by depending on our local and family-owned company for the one-on-one guidance. When you sit down with our financial advisors, you'll find that we never treat you like a number but a valued client—even a family member. We pay close attention to your needs to determine the right investments for you. At the same time, we offer straightforward, common sense advice in layman's terms. So, you always understand how your money is being invested. Grow your nest egg and protect your principal with help from our financial advisor. Call us at (636) 688-7173. The success of your financial plan hinges on making wise investments. Due to our years of experience and knowledge in the business, we can help you make prudent decisions for your financial future. If you have any questions about your current financial situation or you want to schedule a free consultation for a financial review, simply call us today. Our financial advisor will return your call as soon as possible. Well known as a financial educator throughout St. Charles County, Matt Renaud provides exceptional financial guidance for his clients. 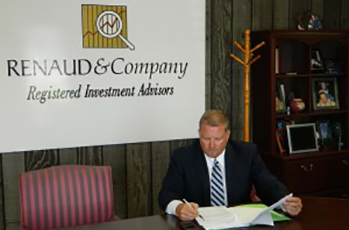 He is a fully certified senior advisor and a registered investment advisor with more 24 years of experience in the field. In addition, he is a Five Star Wealth Manager Award Recipient. His practice focuses on helping retirees avoid common investment mistakes. He counsels his clients on how to avoid pitfalls and see positive financial results. Contact us to start planning for a bright financial future. We offer Financial help to all clients living in the great state of Missouri.